Matcha, matcha, matcha! I’ve been drinking matcha tea for many years and it’s about time that the rest of the world is catching on to this wonder beverage! It’s not that hard to find matcha on a coffee shop menu anymore. 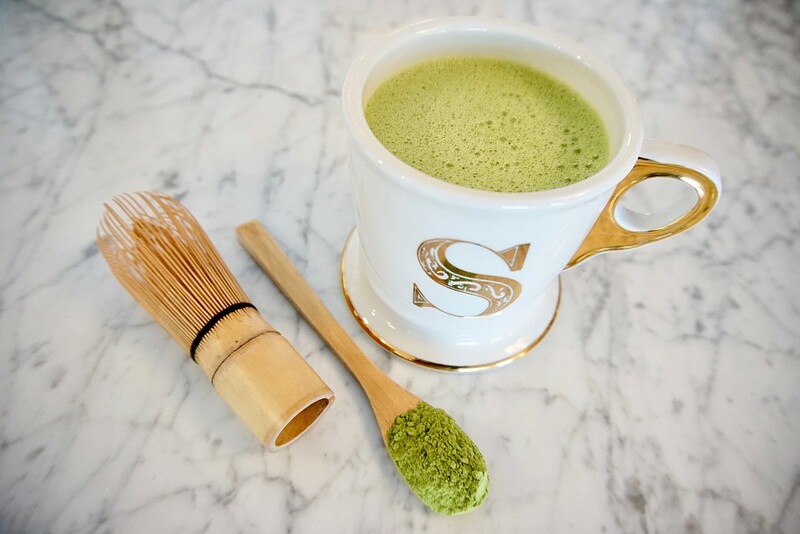 Unfortunately many times the matcha used in commercial coffee shops is full of sugar (I’m looking at you Starbucks) and I would venture to say that they don’t use the best quality matcha powder. 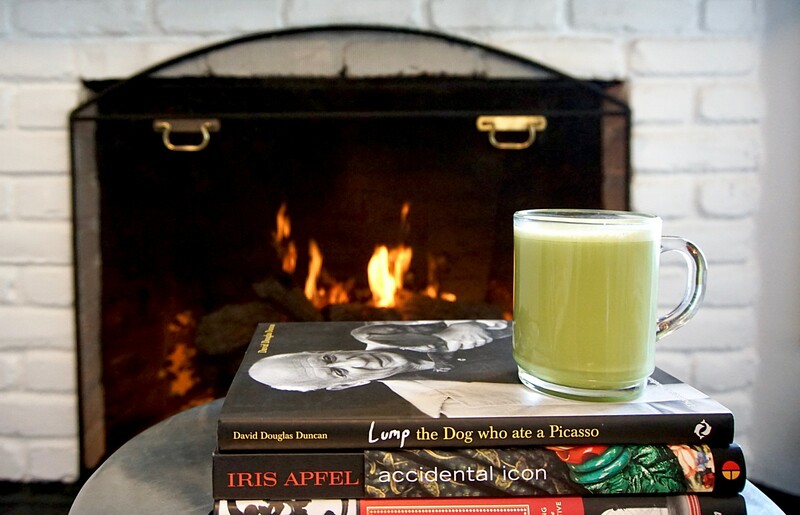 I’m spoiled by my homemade bulletproof matcha latte – which is far superior than anything that I can order at a cafe. I have been a member of the crossfit/kettlebell community for many years. This is where I first learned about eating Paleo, biohacking and superfoods. Years later these buzz words have finally entered the mainstream lexicon and everyone has jumped on the gluten-free, dairy-free, refined sugar-free bandwagon. Most of us educated about nutrition now know that “fat” is not a bad word and a bulletproof coffee with added fat (usually in the form of butter or ghee) and MCT oil can be bought at many a coffee shop whereas just a few short years ago it was only made at home by a niche group. I wanted to be one of those people but while I understood the health benefits of a bulletproof coffee, I don’t drink coffee. Never have, never will. I don’t like the taste and the caffeine makes me jittery. So when I discovered that I can combine my beloved matcha and all it’s awesome health benefits with the ingredients of a bulletproof coffee it was a chocolate/peanut butter Reese collision of greatness – a bulletproof matcha latte! Made from the whole tea leaf, matcha powder is packed with antioxidants. In fact it has 137 times more antioxidants than regular brewed green tea and 1,000 times more than gojiberries, pomegranates, blueberries or acaiberries. Richer in L-Theanine than most black or green teas, matcha powder simultaneously calms the mind yet also provides energy – but not the nervous energy found in coffee. Instead it’s an alert calm energy that enhances mood and aids in concentration. High in EGCC it is believed to have cancer-fighting effects on the body. It also boosts metabolism and helps burn calories. Raw cacao butter is a superfood. It has antioxidants that protect your cells from the damage of free radicals, boosts your mood and brain function, protects your heart and regulates insulin levels. MCT – or medium chain triglycerides – is a healthy form of dietary fat. It helps suppress hunger and boosts metabolism. MCT is absorbed quickly into the body for increased energy, endurance and brain power. Collagen in our bodies provides structure to our skin, hair, bones, muscles and connective tissues but as we age our bodies produce less of it. Adding collagen protein powder to my morning latte helps with skin moisture and elasticity – essential for glowing and vibrant skin. It also strengthens joints, bones and promotes healthy digestion. That all sounds super healthy and beneficial to our bodies in so many ways, right? That might be enough reason for some, but honestly I wouldn’t drink a bulletproof matcha latte if it wasn’t also delicious. It’s creamy and rich and makes me happy. I’m truly addicted – in a good way. Heat the water. Heat the almond milk. 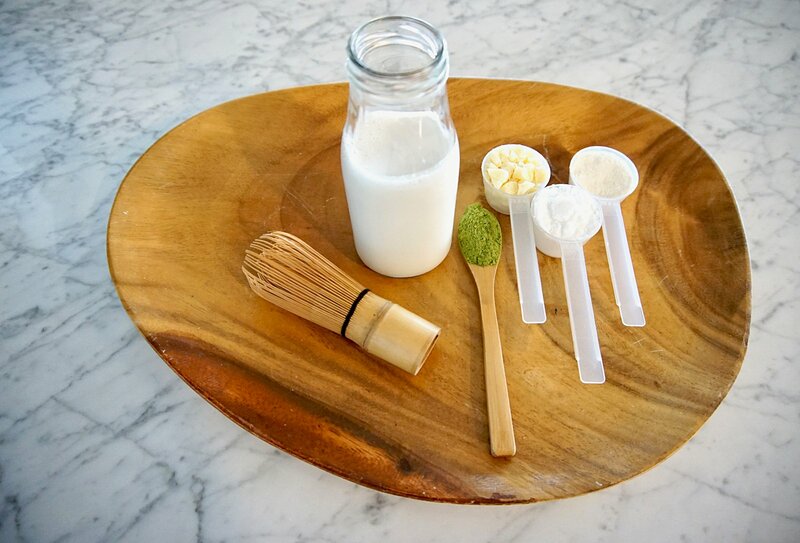 Mix together in a blender safe for hot liquid: water, almond milk, matcha, cacao butter, MCT powder. Add the collagen and blend again for a few seconds. *I heat the almond milk in a glass measuring cup in the microwave for 1 minute. *The properties of collagen are broken down if you blend too long – that’s why you add it last. There are many brands of collagen powder on the market – just use one with pure ingredients. I use Bulletproof. *Cacao butter comes in chunks; I find it helpful to cut up the chunks in a food processor and return them to the bag for easier measuring. I use Bulletproof or Navitas (available at Whole Foods). Oh, and cacao and cocoa are not the same thing! You want to use cacao butter. Here’s a good article explaining why. *Cacao butter gives the matcha latte a white chocolate creamy taste, but you can use coconut manna instead if you like coconut more than white chocolate. Or ghee or butter. Just use some kind of fat! *You can use MCT oil instead of powder but I find that the powder blends nicely. I use Perfect Keto. *Play around with the ratio of water to almond milk that works best for you. *Try to find almond milk with the least ingredients – preferably just almonds and water. It’s easy to make your own almond milk. You can also use coconut milk instead. Or a blend of both. *As you can see, I don’t add any form of sugar because I have conquered the sugar dragon and I don’t miss it. In fact now I get ill if I eat or drink too much sugar. If you need to, you can add a few drops of stevia or some other form of non-refined sugar. But try it a few times without any form of sweetener – and for health’s sake make it a mission to slay your own sugar dragon. *The quality of matcha powder matters a great deal. A good quality matcha powder is bright green in color and smooth in texture. After some trial and error I have found that DoMatcha is of good quality without being crazy expensive. Trust me – you will not like the taste of cheap matcha; don’t settle. *Blending takes away some heat, so I put it all back in the glass cup and heat again for 35 seconds in the microwave. Then I pour into my pink Yeti mug and my bulletproof matcha latte stays hot while I sip for over an hour. P.S. You might want to learn how to make a homemade chai latte as well.